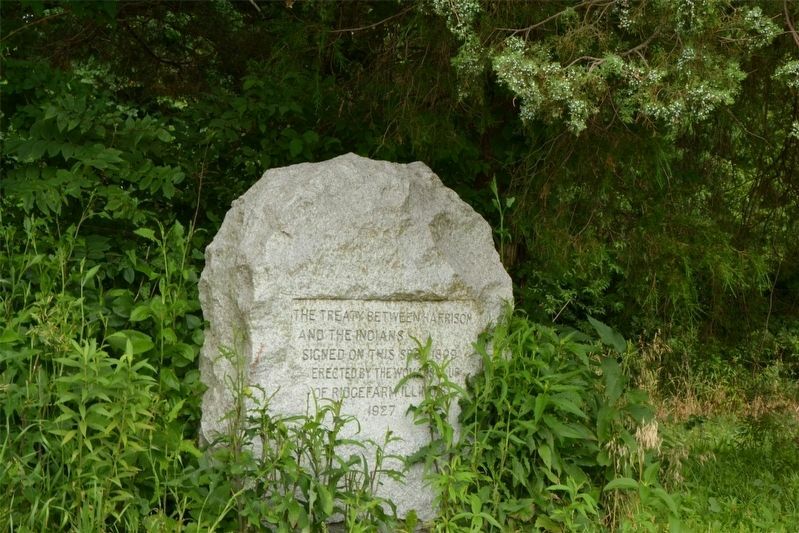 The treaty between Harrison and the Indians signed on this spot, 1809. Erected 1927 by Woman's Club of Ridgefarm Illinois. Location. 39° 53.433′ N, 87° 36.808′ W. Marker is near Ridge Farm, Illinois, in Vermilion County. Marker is on County Road 1720 E 0.4 miles south of County Highway 16, on the left when traveling south. Touch for map. Marker is in this post office area: Ridge Farm IL 61870, United States of America. Touch for directions. Other nearby markers. At least 8 other markers are within 8 miles of this marker, measured as the crow flies. Dedicated to All Veterans (approx. 1.9 miles away); Abraham Lincoln - Eighth Judicial District (approx. 2.3 miles away); Pontiac Peace Treaty (approx. 4.4 miles away); Georgetown Parade of Patriots Monument (approx. 6 miles away); Georgetown Area Honor Roll (approx. 6 miles away); 73rd and 125th Illinois Volunteer Infantry (approx. 6.2 miles away); Veterans Honor Roll (approx. 7.2 miles away); Thy Wonderous Story, Illinois (approx. 7.3 miles away). Touch for a list and map of all markers in Ridge Farm. More about this marker. Marker may be obscured by vegetation. of trees, Pilot Grove, was used as a reference point to calculate the amount of territory to be ceded by the Delawares, Kickapoos, Pottowatomies, Miamis, and Eel River Native Americans under the Treaty of Fort Wayne (1809). "History of Vermilion County, Illinois: a tale of its evolution, settlement, and progress for nearly a century," by Lottie E. Jones (1911), volume 1, page 51-52. "100 Years on the Ridge," by the Ridge Farm Centennial Committee (1974), page 1-3. More. 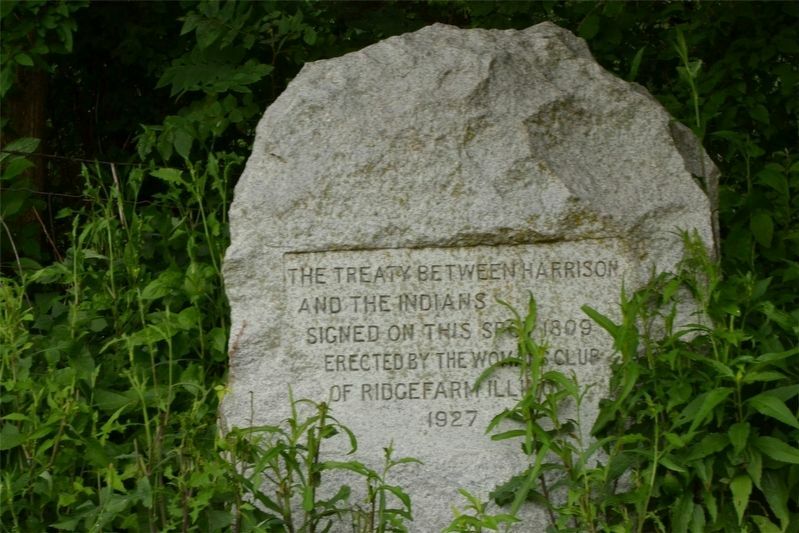 Search the internet for The Treaty Between Harrison and the Indians. Credits. This page was last revised on March 30, 2019. This page originally submitted on March 22, 2019. This page has been viewed 48 times since then. Photos: 1, 2. submitted on March 22, 2019. • Bill Pfingsten was the editor who published this page.